HOMESTEAD, Fla. —The clear waters of Biscayne National Park reflected back a prism of greens and blues. Looking out into the vast area that separated the mainland from the Florida Keys, the steady hum of the boat taking passengers to Boca Chita sped along. 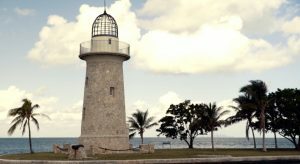 The ornamental lighthouse at Boca Chita was constructed in the 1930s by industrialist Mark Honeywell to guide his guests to his island (Photos by Noelia Graham). “There are four worlds here in Biscayne National Park: the mangrove shoreline, the waters of the bay, the keys and the coral reefs,” said Deborah Mitchell, a ranger who has worked in educating visitors on the park’s diversity for more than 15 years. “It’s our job to be informed, which helps to preserve an area that hosts more than 500 marine animals that make their homes in the four ecosystems located in the park,” Mitchell stated. Since 95 percent of Biscayne National Park is made up of water, this makes the area interesting to navigate. To get to any of the keys, you need a boat, a kayak or a canoe. However the bay is not very deep. It is divided into three main regions: north, central and south where the depths are generally in the range of one to 10 feet. 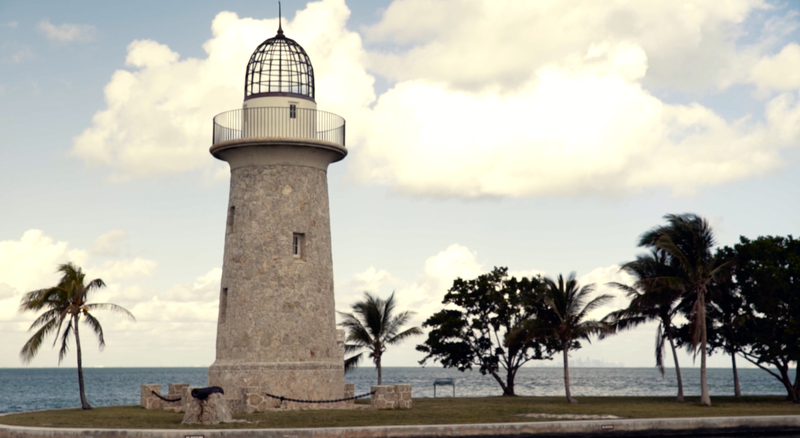 Biscayne Bay has a rich history that has affected the area many times over the years. Looking out into the calm pristine waters it’s hard to imagine a scene less than serene. The park’s keys were used as pineapple farms during the 19th and early 20th centuries which drew the attention of farmers with little money. One of the most notable stories is the Joneses who lived off the land of Porgey Key, but after a hurricanes salted the land pineapple farming was halted indefinitely. Jonathan Chapman, a volunteer who conducts ranger talks in the afternoons, painted a picture of the history to the visitors walking around. “There is evidence of human activity within Biscayne National Park that goes back 10,000 years to the migration of the Paleo-Indians. After the Paleo-Indians, the Tequesta tribe lived off the sea, until Spanish explorers arrived and wiped out the native population by the mid-1700s with their diseases,” Chapman said. The area was once a hideout for pirates, but now it has become a preserve right next to Turkey Point nuclear power plant. It was almost endangered in 1960 when developers and conservationists, fought for rights over the land to develop an oil rig and plans to construct a causeway to an area which was called Islandia. Conservationist Lloyd Miller, who lives in Homestead and supported the struggle to conserve the archipelago in the 1960s remembers the support that Herbert Hoover, the head of the vacuum cleaner company, lent in the fight to keep the area way from developers. In an interview done by The New York Times, he spoke about the impact Hoover had in motivating influential people to act. 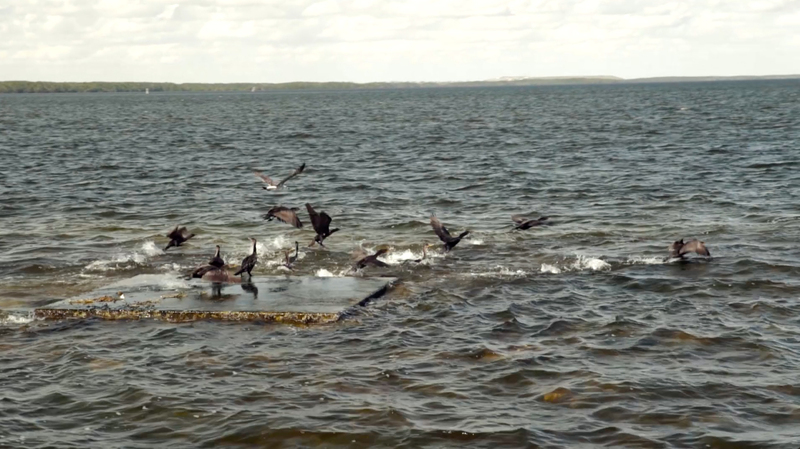 Biscayne National Park is home to more than 500 marine animals including the double-crested cormorant, which rests on rocks and structures around the bay. Finally, after a long fight the conservationists won rights to the land. In 1968 President Lyndon B. Johnson signed a bill that turned most of Islandia into a national monument, which later would become Biscayne National Park. Throughout all of these struggles Biscayne National Park is still not safe. In 2016 a bill proposed by Florida Sens. Bill Nelson and Marco Rubio, named Access to Sport Fishing Act of 2016, would undo the preserve and require the National Park Service to consult with Florida wildlife managers, who opposed the preserve. While the bill has not passed yet, it leaves the future of the park uncertain. The bill is not the only time that Biscayne National Park struggled in conservation efforts. Turkey point which is located right next to the park was accused last year of pumping polluted water into Biscayne Bay. 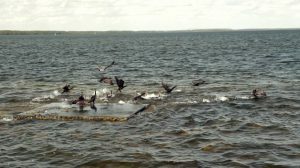 In a report released by Miami-Dade County, water monitors found more than 200 times the normal levels of tritium, a radioactive isotope found in nuclear power production in the water within the park’s boundaries. Scientific American has reported that “cancer is the main risk from humans ingesting tritium” making the discovery of this compound an issue that environmentalist are cautioning against. With a list of issues continuing to pile, the Biscayne National Park also faces congressional budget cuts. In 2011 congress slashed $101 million from the National Park Service budget. As Miller looks out at the bay he sighed, thinking about everything the area had overcome and the challenges it still faced. 9700 SW 328 St., Sir Lancelot Jones Way, Homestead, Fla. 33033. For more information, visit https://www.nps.gov/bisc/index.htm or call 305-230-1144. Parking is available in a lot west of the visitor center.